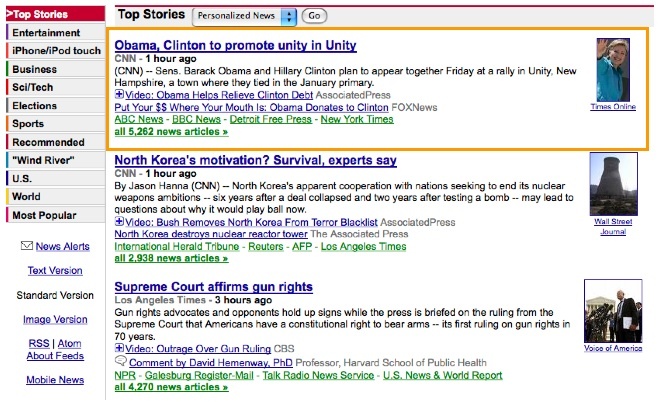 In my daily online travels, Google News is a regular, recurring destination. Here’s a thought about how Google could make the news aggregation site even better, and in the process, make it more indelibly social. Step One: Formally containerize story ‘buckets’ and expose (make visible) handles like tags, categories, view count data, ratings and like minds (people who liked this story, also liked that story). Some of this data Google captures today, some it requires Google either adding UI controls within Google News pages or creating IFrames so that Google can persist a meta-layer around the destination new page (for tagging, rating, categorizing). Step Two: Integrate this functionality with Google Reader, which probably touches Web history and Bookmarks functions, and invariably gets Google down the path of a deeper, more unified user profile model. The key point here is that while Google does a reasonable job of tracking pieces of this data already, it is overly silo’d and simplistic when it could be integrated in a much more high-value fashion beyond just a consolidated view. A best practices way of doing this would be to work backwards from what YouTube does with providing filtered views of video data, personalization and social linkage options to consumers, and apply a similar model to third party news sources. Step Three: Expose APIs to these functions so that third parties, including news publishers, can create applications and web services that leverage the goodness of Google’s depth and breadth. Clearly, not all news sources would opt to participate in all elements of this offering but so long as Google offered an opt-in/opt-out path for publishers, this feels like a natural way to turn consumers into information miners and reward them for their efforts (since they get better visibility to related stories and a path to connect with like minds). For publishers, it becomes part of a continuing breadcrumb strategy to increase the reach and engagement level that consumers have with their content. Plus, if Google provides access to the underlying APIs that they are using, for smaller publishers at a minimum, it gives them pluggable, scalable tools to make the news content on their home web site both social and transparent. Arguably, such a model could then be scaled out to Pictures, Documents and other like Google services. Social Media - it's about Breadcrumbs and Conversations: a construct for thinking about how social media models work. Googling Innovation - Seed, Select & Amplify: on Google's R&D culture. The Chess Masters - Google vs. Apple: why Google and Apple are without peers, and destined for a market collision.